The five battles of Belmont, Modder River, Magersfontein, Colenso and Spion Kop respectively, were all fought on the soil of British South Africa. That this would be an advantage in terms of morale and military manoeuvre turned out to be lofty presumption. Conventional military goals – the overthrow and occupation of the enemy capitals – were not pursued, but rather the relief of Kimberley and Ladysmith became the modus operandi of the British forces. Kimberley: a sorely-needed source of capital for the strained coffers of the Boer Republics; Ladysmith: a quick road to Durban for Boer forces, and more importantly, its seaport, dramatically increasing the chances of foreign intervention. The ramifications for British ‘prestige’ throughout the Empire of the fall of either of these towns were not underestimated by those in Whitehall. At a basic military level, these campaigns were moderately successful. However, their impact on the war in terms of the subsequent change of official attitude was immense: the Boer forces were not tribesmen fighting on foot with antiquated weaponry. They were mounted and equipped with the latest rifles and artillery from France, Germany and England. Many of those in the commandos were veterans of various wars against tribes throughout the region. The battles waged after these campaigns were fought with these hard lessons in mind. These stinging episodes introduced the British army to modern warfare and highlighted the weaknesses of the enemy for the Boer forces. On the 10 November 1899, a skirmish took place near Belmont station and on 23 November, the first important battle on the western front occurred there. Close to the station a number of Orange Free State commandos under Commandant J. Prinsloo occupied several kopjes with the object of blocking the progress of the British forces under Lord Methuen, who was attempting to raise the siege of Kimberley. This was the first battle in which these commandos fought, and they were up against a force far superior in numbers and arms. The fact that the British had almost everything in their favour decided the battle. By means of assaults on the kopjes they succeeded in driving the Boers from them. The commandos then retreated northwards. After he had once more forced the Boer commandos to retreat in the Battle of Modder River on 28th November 1899, Lord Methuen was within sight of fulfilling his chief objective, the relief of Kimberley. His losses had been great, so he first waited for reinforcements. After they had arrived, he sent a strong force under the command of Major-General A.G. Wauchope on the night of the 10/11th December to drive the Boers at Magersfontein from their position. General P.J. Cronjé, who at that time was in charge of both the Free State and Transvaal commandos allowed himself to be persuaded to dig trenches – as planned by General J.H. de la Rey – at the foot of the ridges at Magersfontein. These trenches made his burghers invisible to the enemy. In the early morning of 11th December the British forces unexpectedly came up against the Republican positions. They were met by a withering fire on the open veld and suffered heavy losses. One of the first men killed was Wauchope. The British were unable to withstand the heavy fire of the Boers, and in the afternoon Lord Methuen broke off the engagement and took his badly battered regiments back to their camp at Modder River. This battle was fought on the 15th December 1899 during the first attempt by General Buller to relieve the besieged garrison at Ladysmith. 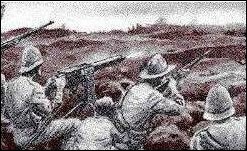 The Boer commandos, led by General Louis Botha, had taken up entrenched positions on the kopjes on the banks of the Tugela. Buller and his staff thought the Boers were on the high ground much further back and with over 20 000 men launched frontal attacks. The British infantry, supported by artillery, tried to cross the river four times, but were driven back with heavy losses. They were also forced to tactically withdraw from ten big guns and empty ammunition wagons, in the hope that a fresh ammunition supply would allow them to be used afresh. In his second attempt to liberate Ladysmith, Buller wanted to bypass the Boer positions at Colenso from his left. His advance was so slow, however, that Botha had ample time to block his way. After the struggle had lasted for a few days, Charles Warren, who was in command of the battlefield, thought that he could break through the enemy lines by taking possession of Spion Kop. This resulted in one of the major battles of the war on the 24th January 1900. Botha’s snipers and artillery subjected the summit of Spion Kop to such a heavy fire that the position there became intolerable. 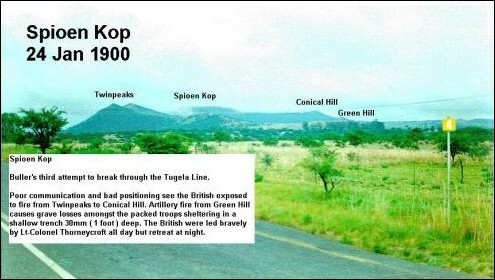 Having suffered severe losses, the British abandoned the hill (one of the greatest blunders of the war) under cover of darkness and retreated to the southern bank of the Tugela. 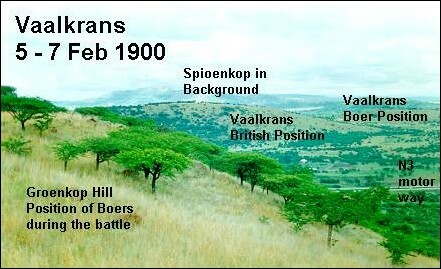 The Boers, who were also withdrawing, immediately reoccupied Spion Kop. The following list is alphabetical not chronological. However, the dates are listed for convenience. Thirty kilometres from Ottosdal on the Delareyville road on the left side, stands the memorial that was erected in memory of the Battle of Boschbult on 31 March 1902. The actual battle took place approximately 500 – 1 000 yards west in the direction of Brakspruit. Col. Cookson with his columns, a division of Kitchener’s forces, made contact on the farm Bospan with a commando of Gen. Liebenberg, who he had followed the whole morning. Liebenberg did not expect the attack and quickly moved to the front in a thorn-bush on the farm Boschbult where they took up position and stopped Cookson with severe canon and gunfire. Cookson took up position in a residential house and in a cattle kraal on the eastern side. With his Mounted Rifles and canons, and supply wagons, he also took up position in another residential house at the western side where a woman and children were. The rest of his force took up position at the southern side behind the low banks of the Brakspruit. The Boer force was soon supplemented with the commandos of Gens. Kemp, Celliers and Du Toit. A severe attack was launched on Cookson thereafter by Kemp and Du Toit, but due a misunderstanding between Kemp and Liebenberg, the last-mentioned did not give support and the attack was a failure and a checkmate situation occurred. When Gen. De la Rey appeared on the scene later the afternoon, he instructed the commandos to withdraw immediately as he was of the opinion that Cookson already informed Gen. Kitchener on Driekuil and that a relief force was on its way. In reality Cookson had tried the whole afternoon of 31 March to contact Kitchener on Driekuil, but without success. Kitchener, who could clearly hear the canon-fire on Driekuil, moved in that direction with a force but turned around on the farm Doornlaagte (today Humanskraal) when he wrongly received the message from fleeing blacks that Cookson was taken by surprise by the Boer forces. Back on Driekuil he informed his head quarters in Klerksdorp that Cookson was defeated and required reinforcements. Col. Rawlinson with basis on Renosterspruit (at the other side of Klerksdorp) received instruction to move to Driekuil. The morning of 1 April Kitchener arrived on Boschbult with an enormous force and found that his information was incorrect and that the Boer forces had withdrawn the previous day. Cookson was out of danger. The afternoon of 1 April Kitchener and Cookson returned from Boschbult back to Driekuil where in the mean time, Rawlinson had arrived with a reinforcement of 3 000 men. Losses on both sides were high. On the Boer side 40 men was killed or wounded and on British side 178. The losses of horses and mules due to canon-fire, seriously disadvantaged Kitchener’s mobility. The occupation of his home town offended General De la Rey immensely. On Sunday 2nd March 1901, he decided to end it. With a force of 1 500 men under Generals Celliers, Liebenberg, Smuts, Lemmer and Du Toit they stormed the town, occupied by a garrison of 600 English soldiers under Colonel Money. The attack did not go according to plan as Liebenberg went in too early, on horseback, not on foot as planned. The other commandos were not in position yet. De la Rey came under fire on his way through the swamp. Celliers and Lemmer were wounded and their burghers retreated. Commandant Vermaas advanced to the middle of the town, but the retreating burghers left their flanks open and De la Rey had to attack again to support them. Under the cover of night De la Rey retreated when it became clear that he could only free the town with severe losses. After the attack Money, vindictively, had all the willows in town axed. The spotlight of war settled for a brief, blinding moment on the slopes of Talana Hill on October 20th 1899 when the Battle of Dundee hit the headlines of the world: the first clash between Boer Commandos of the Republics of the Transvaal and the Orange Free State and Imperial and Colonial British regiments marked the healing of a long and bitter war. In the darkness of the night of the 22nd – 23rd October, the British troops slipped hastily away down the muddy passes of the Biggarsberg towards Ladysmith. The exultant Boers occupied Dundee. The spotlight’s beam swung away to concentrate on other areas. Dundee slipped into the shadows. But the war remained for both town and district real and brutal, they paid a heavy price right to the bitter end and beyond. British military consensus was that the Northern Natal triangle, so vulnerable to attack from so many points across the Buffalo River frontier and down the Drakensberg passes, should be abandoned and the principal towns evacuated. However, a strong lobby, swayed by colonial mining interests, demanded the defence of Dundee and Elandslaagte; their mines were vital to the shipping companies on whom the British Government was relying to transport men and materials from Britain and the Empire. Moreover, rebellion by dissident Boers in the Biggarsberg or by disaffected natives in the Weenen area was a real threat; the holding of the Biggarsberg would be a deterrent. The decision was taken to hold Dundee. On the 25th September, the first Imperial troops steamed in. By the 16th October, 4,000 men of the Dublin Fusiliers, the 60th , the King’s Royal Rifles, the Leicesters and the Royal Irish Fusiliers (direct from Alexandria in Egypt) were spread in a huge tented camp across the gentle rise of Ryley’s Hill between Dundee and Glencoe. The Dundee Troop of the Natal Carbineers was marched in on 29th September, their C.O., Captain Charles G.Willson at their head. General Sir William Penn Symons in command of the British forces, was known to his military associates as headstrong and overbold. He was determined to hold Dundee. He had perhaps a sentimental attachment to the place. Twenty years earlier he had been with the 24th Reg. On the day of the battle of Isandlwana, he was with Chelmsford’s force and not in the battle itself. He had spent 2 months or more in the British H.Q. in Fort Jones (site of present day Dundee) prior to the Second Invasion and had received much kindness at the hands of the Smiths of Talana and other local families. Moreover, he felt inclined to protect the interests of his fellow Cornishmen, who were a large company in the coal-mining fraternity. That same day Newcastle fell to the Boers without a fight. Commandant-General Joubert, in command of the Boer forces,dispatched his 14,000 burghers in three columns. They moved on, in pounding rain and-over terrible roads, intent on their first target, Dundee. General Kock led the Johannesburg Commando and the Hollander and German Corps directly south over Mkupe Pass towards the Elandslaagte Colliery. General “Maroela” Erasmus, with 4,000 men from Pretoria, Heidelberg and Boksburg went southeast through Dannhauser and Hattingspruit. Swinging east along the line of the Buffalo frontier, General Lukas Meyer led the Middelburg, Wakkerstroom, Utrecht and Vryheid men to concentrate at the Doornberg, overlooking the frontier post at De Jagers Drift. The net was closing around Dundee. Overconfident, Penn Symons persisted in his decision to defend Dundee. Evading General White’s pressure to retire on Ladysmith, he limited himself to evacuating civilians. For 3 days, Monday 16, Tuesday 17 and Wednesday 18 October, Dundee’s Town Clerk, Francis Birkett, dignified in top hat and frock coat, strode purposefully round the town, knocking at doors and ordering women and children to report to the station. It was a pathetic exodus, as some, thrice fugitive, from the Reef, from Newcastle, bewildered and beaten, piled a few sorry possessions on a handcart and trundled it through the streets. The Town Guard, the Natal Carbineers, municipal, government and mining officials, clergy, police and some storekeepers were staying to look after their interests. The Boers cut the railway line at Elandslaagte. Dundee was cut off. Mr. Monypenny, the only war correspondent of the many in Ladysmith, who had taken the trouble to come up to Dundee to see what was happening at the front line. He was to “scoop” the world papers with his news of the first battle of the South African War. Jubilantly the Boers stood on Talana Hill on 20th October “saying good morning to the British”. On the night of the 19th they had prayed fervently for victory, as they massed in the blackness of a wet night at the Doornberg. Filing out they had splashed across the Buffalo River at 9 p.m. then in pelting rain, battled guns over the muddy tracks. After midnight Major Wolmarans of the Staats Artillerie hauled up 3 x 75mm Creusot cannon and a pom-pom. The Utrecht and Wakkerstroom Commandos occupied the summit of Talana Hill. Across Smith’s Nek, the Middelburg, Piet Retief and Vryheid burghers crowded Lennox Hill. In the west on Mpati mountain, General Erasmus’ 4,000 men were impatient for battle. The Boers, shrouded in the mist, surprised the British camp; their second shell just missed General Penn Symons’ tent. From their grandstand view the Boers cheered and laughed as the startled troops and horses began moving hither and thither. Within 10 minutes the 67th Battery of the R.F.A. was spraying the slopes of Talana Hill with shrapnel. The gun teams of the 13th and 69th Batteries galloped through the streets and gardens; startled householders woke up to find men cutting their fences. Excited housewives started “supplying the men with coffee and cocoa, also bread and butter, which came very acceptable indeed” on the raw morning. Leaving the Leicesters, Carbineers and Natal Police to guard the camp from an attack from the Impati, the General and his staff led the Irish and Dublin Fusiliers and the Kings Royal Rifles at a trot through the town. At a range of 3,650 yards the Royal Field Artillery opened up and silenced the Boer guns, then galloped on to 2,300 yards distance. In the gum trees at the bottom of the town and in the shelter of the stream banks, there was confusion as officers tried to sort out their units from elements of the public, from R.A.M.C. dhoolie bearers and from volunteers. The Town Guard, who had been rudely disturbed by the arrival of the Boer’s first good-morning shell whilst taking coffee after a night’s patrolling, had put on their bandoliers and taken up their rifles and come to join the fight. At 8:50 a.m. the order rang out: “Forward the rifles, the gallant 60th and take that hill!” The K.R.R. surged out of the stream bed with the Royal Irish Fusiliers on their right flank making towards Lennox and the Dublin Fusiliers moving out to the northwest flank of Talana. As the scurrying, bent figures ran across the open flats to the cover of the bluegum plantations, “the Boer Mausers were singing ping-pong”. In a patch of corn close to the river, the Sepoy dhoolie bearers, found their first casualties. Gallantly they carried the wounded back time after time through heavy fire to Betania and other field hospitals in the town. The British casualties were heavy in the three-hour frontal assault on Talana Hill. In a tough and savage fight, the Royal Irish Fusiliers were enfiladed by cross-fire from the burghers on Lennox Hill, the K.R.R. were hit by their own artillery shrapnel and the Dublin Fusiliers were badly mauled, attempting to scale the donga that ran up the northern flank of Talana. General Penn Symons was mortally wounded. At a critical moment as his forces were wavering and taking shelter amongst farm buildings and behind the stone walls or in the bluegum plantations, he rode right across the field of battle to rally the Dublins. Recklessly exposing himself in the company of Staff Officers and a Lancer with pennant flying, he was shot down as he stepped over a wall. He gamely remounted his horse, quietly handed over command to Major General Yule and retired without fuss towards the town. Magnificently led by their officers, the British now made the final assault up the face of the hill. The officers paid the price of their courage. The northern donga claimed Captain Weldon, the stone wall along the mountainside Major Boultbee, Captain Pechell and Lieuts. Taylor and Hambro. The final rush saw Colonel Sherston fall and Colonel Gunning fell on the crest as the day was won. At noon the guns fell silent and cheers rang out from the summit of Talana Hill. The reality was very different. Certainly the Boers were in full flight towards the Buffalo River and their forces were badly demoralised. But they were saved from total annihilation by the inexplicable failure of the R.F.A. Batteries now mounted in Smith’s Nek to fire on the retreating Boers. The Commandos crossed the river unscathed. The cavalry under Colonel Moller and the 18th Hussars failed to cut off the fleeing Boers and they found themselves cornered on Adelaide Farm, miles away from Talana and were forced to surrender by Erasmus’ men from Mpati. The Utrecht and Wakkerstroom Commandos, on whom the brunt of the battle had fallen, had put up a tremendous resistance and had paid a heavy price. The first burgher to fall was Dirkie Uys of Utrecht, yet another of the ill-fated Voortrekker family, whose warrior sons had fallen in 1838 and 1879. The casualties on the British side numbered 51 dead or dying, 203 wounded and 211 taken P.O.W. The Boers lost 145 men.